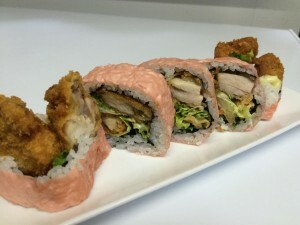 This is our newest roll for chicken lovers. Have a happy valentine at SUSHI51! 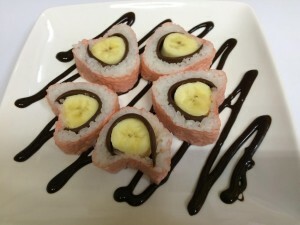 This is banana chocolate sushi roll. Banana tempura, sliced chocolate and cream cheese rolled with soy paper. Remember, this is still sushi. It is available until February 14th. February 3rd only one day special. Shrimp tempura, avocado, fake crab, egg omelet, cucumber, flying fish roe, pickled ginger, salted kombu see weed, pink sweet fish flakes and crunchy tempura flakes rolled in sushi rice with see weed paper. \500 with lottery coupon ticket. In Japan, we have a custom of eating EHOMAKI at the night of Setsubun(Feb. 3). You eat a long sushi roll, while facing silently toward the year’s lucky direction(south southeast) with your eyes closed, wishing for perfect health. 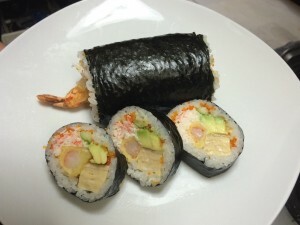 Try our one day special roll!